Today I am writing about possibly one of the most perfect gifts you could possibly give a makeup junkie. 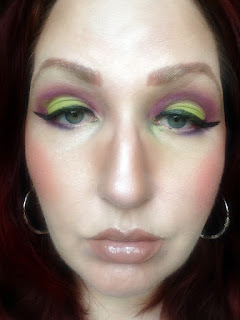 I am talking about the blockbuster SEPHORA COLLECTION Geometricolor Palette. It is so good that it is already sold out on www.sephora.com (that is why I don't have a link to it). This blockbuster palette comes with 80 eye shadows, 32 brilliant lip glosses, 6 cream eyeliners, 4 blushes, 4 face powders for contouring and highlighting, 4 brow powders and 2 tutorial cards. It is enough to make one swoon. All this for the kick you in the face price of $49.50. The value is tremendous. Enter a world of infinite color with 130 shades of makeup! Everything is set up into harmonious groups for multi-dimensional magic. Easy colors with matte, semi-shimmery or iridescent finishes. Everything you need to bring out the best in your face, perfect the complexion, bring out the best in your eyes, brows, lips and cheeks; to reveal various facets and perfect everyday makeup. What I actually really like about this palette is that everything is actually pigmented, creamy, has good texture and lasts a long time. The colors are worth wearing. I was pleasantly surprised that I liked the palette as much as I did. Usually you don't find as much quality in blockbuster palettes as you do the smaller ones but this one is pretty good. I used a few of each item, just to make sure and they were not duds. I really liked the eye shadows, blushes, cream liners and lip glosses the most. Here are some photos I did using some of the colors in the palette. Notice I used a brow color from the palette that is markedly different from what I normally wear. It is much lighter and that I was not happy with. All the colors on my face are from that palette. This palette would make a great gift for anyone who LOVES makeup, like I do. So keep it in mind for your sister, girlfriend, a loved one or a good friend. Or buy it for yourself!!!! I would. It is currently available at SEPHORA stores for $49.50. Like SEPHORA on Facebook: https://www.facebook.com/Sephora?ref=br_tf; Follow SEPHORA on Twitter: @Sephora, Follow SEPHORA on Pinterest: http://www.pinterest.com/Sephora/; Follow SEPHORA on Instagram: http://instagram.com/SEPHORA#; Subscribe to SEPHORA on YouTube: http://www.youtube.com/channel/UC9YX5x_VU8gfe0Oui0TaLJg; Follow on Google+: https://plus.google.com/+ Sephora/posts; Follow SEPHORA on Wanelo: http://wanelo.com/sephora and Follow SEPHORA on Tumblr: http://theglossy.sephora.com/.